What a great time at the Fair this year. I often have trepidation at the outset: will I see and eat everything I want to? My fairmate always teases me: remember, we ARE professionals. We attend the Great Minnesota Get-Together every summer, always on opening day. Gotta catch it when the deep fat oil is fresh, and there are still yardsticks to be had in the Merchandise Mart. I train for this event like a seasoned athlete. Study the new foods, decide what I want to try: yes, on the deep-fried bread pudding, no, on the Idaho nachos. That kind of thing. Make sure I have enough room in the tum for what I want to eat. In years past, I have made the mistake of eating breakfast before attending. Wrong. Why waste the precious stomach room, ya know!? I have seen changes in my eating marathon through the years. Honestly, I don’t have the capacity to hold that much, I have a better internal monitor for fullness. And discriminating. Yes, I know when you are weighing deep fried dill pickles with chocolate sauce against pork belly sliders, it may not seem like a gourmet challenge. But this is the fair, dammit! Whadya expect? Corn dog foam? And, when you have a companion, you can share. Which we did. Let’s get to it: honey ice cream with sunflower seeds, battered and deep-fried green beans, deep-fried bread pudding, Pronto Pup (pictured above, you may know it as a corn dog), Walleye roll (think lobster roll except made with a Minnesota native fish that’s in the perch family), a dough-sant (state fair version of the cronut) with iced coffee, sasparilla, a sip of Guinness, thick vanilla shake purchased outside the Moo booth at the cow barn, dream peach (a big ol’ succulent, drip-down-your-arm juicy sweet peach), miniature pumpkin pie served with cinnamon ice cream, sausage sampler (bourbon wurst, wild rice sausage with jalapeño and Swedish sausage with potato), lots of water and the evening capped off with a flight of admittedly mediocre but earnest Minnesota wines. Not all 10 hours at the fair was Food. We made our usual pilgrimage to watch Roger demonstrate the fascinating craft of bowl turning on a foot-operated lathe. He’s a talented, personable, humble man who started turning bowls because he loved history. He dispenses aphorisms as nimbly as his flying wood chips. He makes exquisite pieces for daily life — those bowls. He uses them himself to drink his beer. Isn’t it frustrating, I asked him, to put all those hours into these bowls, knowing that if you hit a knot just wrong, it will break? I love that phrase. As I love those bowls. My friend and I set out on the fair history tour: visit 13 sights, punch your card at the kiosk, win a gift! I learned that several of the notable Art Deco buildings were WPA-built. 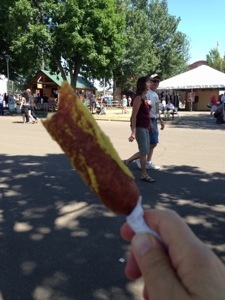 That Teddy Roosevelt made his “carry a big stick” speech at the MN State Fair. That Matisse, O’Keeffe and Picasso showed their work at the Great Minnesota Get-Together. For our prize, we each picked a sheet of State Fair postcard reproductions. 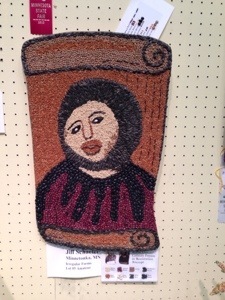 We capped our night with what seems to be becoming a tradition: a walk through the crop art exhibit (seeds and stems made into “fine” art). It was truly a fair to remember. Published in the New York Times! !